The grant of King Henry of Tyrol, in favor of certainmembers of the Tyrolean noblemen, for the first 40 jugheri of uncultivated land on the hill of Roveré della Luna (one jughero was at the time the unit ofmeasurement of the surface) dates Nov. 29, 1327 and wasgiven in order to turn it over. 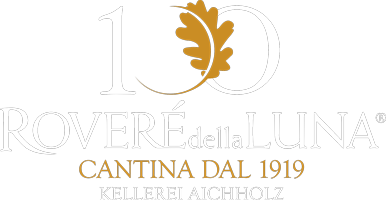 On the site some houses andthe first vineyards were built and the new village was firstnamed Aichholz, then Roveré della Luna. The various locationswith vines around them were given the characteristicnames, that now distinguish the wines coming fromthose places of the 40 jugheri collection. Typically paired with risotto goes well also with fried based dishes and raw meat. Complex scents of peach and ripe pear along with sweet notes of vanilla given by the long ageing in wood. A round and smooth taste, a well balanced freshness. Its tropical fruit notes combined with white flore hints and light spicy scents exalts sea and lake crudité. The round, fully aromatic taste, a good structure and a long persistence make this wine a perfect companion for non creamy dessert such as Torta Montebondone. A long ageing in wood gives elegant red ripe fruit notes along with balsamic hints. Full and round in taste, of good structure. Perfect pairing for braised or stew meat, game dishes and aged cheese. Elegant and silky, of good structure, matches really well with game (birds) and pork o beef meatballs. The intense red fruit notes with delicate vanilla scents given by the wood ageing enhance mid-aged cheese.